Norah Jones has the kind of timeless voice that I never tire of hearing. Her mellow, rich melodies envelope like a warm, fuzzy blanket and carry the listener away to a calm and slower paced world. Every time I listen to one of her albums I have the urge to grab a cup of coffee, sit in a comfy chair and observe the world as time passes by. The talented singer shows off her musical versatility in her newest album, ...Featuring Norah Jones . The album released last week on November 16th and is a collection of various collaborations with well known artists including the Foo Fighters, Ray Charles and Dolly Parton. The 18 songs on the album were recorded over the last decade and showcase a wide range of musical styles. Some of my favorites include the "Virginia Moon" (with Foo Fighters) with it's jazzy, bossanova beat and "Ruler of My Heart" (with Dirty Dozen Brass Band), a bluesy song sung with attitude and heart. And, of course, November is the ideal time to listen to Norah's version of "Baby It's Cold Outside" (with Willie Nelson). The two banter back and forth together so perfectly, they could have wrote the spicy song. Another favorite toward the end of the album is a cover of an 80s song originally sung by Roxy Music, "More Than This" (with Charlie Hunter). Norah's sultry, jazzy style gives the song a whole new life. If you're a Norah Jones fan, make sure to add this album to your Christmas list. And make sure to check out the interactive widget below. It's one of the neatest widgets I've come across. 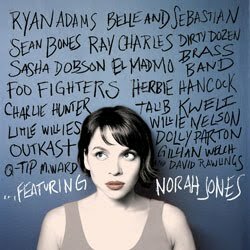 You can click on the names to hear snippets of the songs and watch videos of Norah discussing the various collaborations on the album.